At one time or another, everyone has wished she could be someone else. Exploring this universal longing, Allie Larkin follows up the success of her debut novel, Stay, with a moving portrait of friendship and identity. 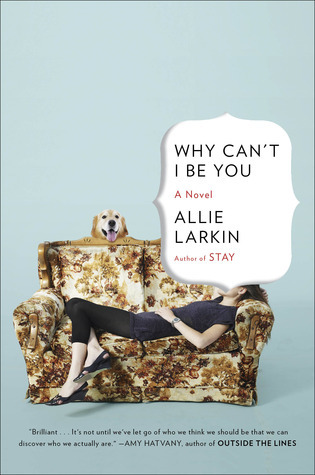 Somehow, I feel that I’ve outgrown chick-lit ages ago (it’s funny how I’ll never really outgrow YA, though), but when an opportunity arose to review Why Can’t I Be You by Allie Larkin, I felt an immediate connection and jumped at the chance to do so. There was something about the retro-looking cover that pulled me in right away, and the idea of stepping into someone else’s shoes so completely both thrilled and intrigued me. Who of us wouldn’t want to be someone else, at least for a day? There were days when I just wanted to leave everything behind and become someone new, someone daring and social, someone who took chances on every turn or at least someone who felt comfortable in their skin. Our own skin can get too tight, and wanting to escape it makes sense in some situations. That’s what Jenny did. When the opportunity presented itself, she jumped at it and never looked back. After all, her boyfriend-soon-to-be-fiancé just left her for a girl equally average and plain – not even an upgrade, which was more insulting than anything else. I’m not sure classifying Why Can’t I Be You as chick-lit is exactly fair. I’d sooner call it women’s fiction (there is a slight difference in quality between the two in my opinion). It’s certainly less formulaic and flaky than your average Sophie Kinsella novel, and there were some genuine emotions there felt heavier and more honest than I’d expected. Despite its pretty simplistic plot, Why Can’t I Be You surprised me with its emotional complexity. It was thought-provoking and entirely satisfying. I loved the very subtle romance between Jenny and Fish, but even more, I admired her friendship with Jessie’s former best friend. All things considered, Why Can’t I Be You is a good way for us YA and UF readers to step out of our comfort zone and stir things up a bit. Please visit the other tour stops too. You can find the schedule here. Thank you to AToMR Tours for organizing this tour. I actually really love chick lit so I think I would like this one. I really like the premises, it sounds intriguing and I am glad you did enjoy it. I ended up giving this one a 3 too. The plot dragged in some spots I found and I started getting kind of bored. I agree that I liked the subtle romance between Jenny and Fish. I liked that because these people didn't know Jessie for 13 years she was able to use some of her real life in the details of where she had been so they did get to know Jenny a bit along the way. Great review! You're reading Absent! Ahh! I really liked that one! Glad it had emotional complexity. I def like the premise of being someone else for a day, I agree, most people would like that experience. Sounds like a fun book certainly when you can step into somebody else's shoes. However since I avoid chick lit/women's fiction like the plague, I don't think it'll be for me. But, I'm still glad you managed to enjoy this one even though you thought chick-lit wasn't your thing anymore! I don't think I have outgrown chick lit sometimes it is the perfect read when you need something light and entertaining. Ha ha. I was drawn to this cover and book as well when I put it in a Friday Forecast and I thought seriously about reading it. It sounds good but I am so overwhelmed that I don't think I can squish it in anyway. You know a good chick lit book I read awhile back that I loved it was before the blog... Melissa Senate's The Love Goddess Cooking School. oh and if you have never read Sarah Addison Allen drop everything and read one of her books! I'll never outgrow YA, but I do get what you mean about chick lit. I don't read much of it and have been surprised at those that I have read. So far I've been lucky. I'm glad this one seems to be more complex that you thought. I find the label of "chick-lit" offensive and don't read too much of it as it just seems too formulaic for my taste. Not sure this is for me, but I do know some readers who might enjoy this one and I'll pass the recommendation to them. Thanks! p.s. I hope you're liking Clockwork Prince! Just started "Unholy Ghosts" this morning. I have never ever seen this book around, but am glad to have discovered it on your blog! Great review :) I really like the vintage-y cover, too! I do enjoy a good Chick Lit / Women's Fiction from time to time so I might pick it up (sounds like a good Spring/Summer read). Thanks for sharing your thoughts with us! I can totally understand the impulse to jump into someone else's shoes, especially if their life seems better than yours (the grass is always greener, after all). This one does sound like a cute read! I can see why you would have said yes to this pitch. I like a good story like this one (is it chick lit or is it women's fiction? pfft. Who cares, right? As long as the story's good!). Well, that is a great idea for a book! I know I can relate, as well. I'm surprised to hear you say this one had a lot of emotional complexity because I usually assume (maybe unfairly) that chick-lit isn't very emotionally complex, and for that reason I would think this to be women's fiction, as well. I'm definitely all for chick-lit that is more honest and real! Great job on this review, Maja! I'm more likely to pick up chick lit rather than women's fiction, but if its one that definitely toes the line that's even better. Fun with some serious is good. I don't read enough women's fiction, but I've really enjoyed the few books I have read that straddle the women's fiction/chick lit line. You're right, it's nice to get outside your comfort zone and get a broader perspective now and then. This sounds like a great choice for the next time I feel like mixing it up. And I wouldn't mind that adorable cover facing out on my shelf either. :-) Wonderful review, Maja! This sounds interesting. I don't read a lot of this genre, just sporadically, it does sound good. Great review Maja, I laughed when you said the cover drew you in because I hate it but the synopsis has me curious as does your wonderful review. I like that you felt it had more depth then a classic chick-lit book. Once in a while I like to read books other than YA. I usually tend to read chick lit or crime thrillers. I'm glad to hear that this wasn't just your regular chick lit and it packed a lot more emotions. The plot sounds something I might enjoy. Lovely review, Maja! The only chick-lit books that I've read are Meg Cabot's. In general, I tend to stay away from that genre so I'll probably skip this one. But, I like the idea of stepping into someone's shoes for a time. I don't know how many times I've wished that for myself so it's definitely something I can relate to. I'm the kind of reader who turns to chick-lit when I get bored of YA books. This sounds like it packs more emotions than your regular chick-lit though. I'm glad to hear that you enjoyed it. I think I would like the friendship aspect too. The synopsis on this one does sound hard to resist and I like that you say it has more substance. I've read a few good reviews for this book. The premise sounded a little fluffy and farfetched but the reviews have me wanting to give it a shot. I'd honestly jump at the idea of being someone else for a change.. even just for a little while. This actually sounds like a sweet read, but since i dont reach chick-lit, I don't think i'll ever pick it up! Great review! Wow amazing review Maja! I ould love to be someone temporary like you and Jenny too! To see what someone's elses life really is like. I'm glad you enjoyed it! And it was more profound and real then it first appears. I haven't anything about this until now but I really like the cover as well, the sofa and the baby blue really stand out. I think it would be cool to be able to experience the life of someone else, even if it's only for one day!